Congratulations! You have 14 days(2 weeks) to claim your prize. I just want to say thank you to all my visiters these last few days. I’ll be annoucing the winner in a few days, on May 23rd. The winner will also be contacted in a few days time from the annoucement, if they have yet to claim their prize. If they do not claim their prize within 14 days(2 weeks), their prize will be forfeited and granted to the runner-up. And so and so on. Hello everyone. Thank you for stopping by today, I hope you take the time to visit some of the other tours participating in this blog hop. The are over 200 participants. Each blog will be holding their own giveaways and will have a message of their own for you. Today is International Day Against Homophobia and Transphobia. Here is the official link for today. 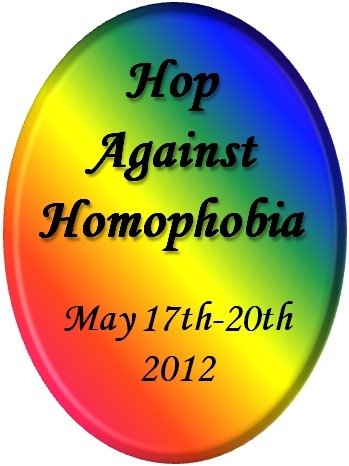 This blog hop was started by Erika Pike, K-Lee Klein and NJ Nielson over at the Hop Against Homophobia blog. This blog hop is dedicated to bringing awareness to homophobia and supporting the community of m/m romance writers and the m/m romance genre. The giveaway is at the bottom of this post. Recently I did a guest post on why I write gay romance. You can find it here. It is short and to the point and doesn’t even begin to scratch the surface. My reasons for writing gay romance are similar to my reasons for why I am against homophobia. I understand some people believe that GLBT person makes the choice to be the way that they are. But, that’s just the way they are. That is who they are. It is unfair and unjustified to expect a person to not be themselves or to change simply because you don’t like it. There are things everyone dislikes about someone else. And that’s okay. No one can control the way other people feel but it is not okay to degrade, abuse, hurt, kill and destroy a person because of their differences. I will never understand the reason for all the hate focused on the GLBT community. Of course the GLBT community are not the only ones forced to deal with hate on a daily basis, I’m not ignorant of that fact. I’ve dealt with the bigotry as a child. I’ve given up watching the news because I find it to be so depressing as of late. It breaks my heart to see that a ten year old boy has killed himself. Children that age shouldn’t even know of such things. Or hearing the story of the girl who lost hope, who thought no one was there for her. The man who made himself marry a woman because he didn’t want to lose his family. There should be no reason for these things. Earlier in the year I did a post of a note I found on a writer’s profile. If you have the time, take a second to read it. It really touched me and I think it will you, too. It gets straight to the point of homophobia. And I can’t imagine ever being able to say it better. If the rafflecopter isn’t working just leave your name and email and a short comment on why you’re against homophobia. The winner will recieve one ebook copy of From Love and Pain and one ebok copy of one of the five books listed above.